Heat oven to 350°F. In medium bowl, stir together eggs, sugar, vanilla and salt. Gradually stir in warm soymilk. 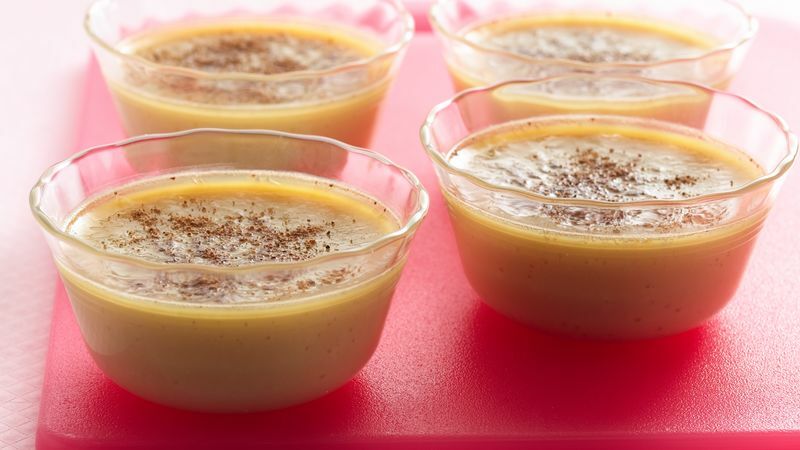 In 13x9-inch pan, place 6 (6-oz) custard cups. Pour soymilk mixture evenly into cups; sprinkle with nutmeg. Carefully place pan with cups in oven. Pour enough very hot water into pan, being careful not to splash water into cups, until water is within 1/2 inch of tops of cups. Bake 50 to 60 minutes or until knife inserted halfway between center and edge comes out almost clean (a small amount of custard will cling to knife). Using tongs or grasping tops of ramekins with pot holder, carefully transfer cups to cooling rack. Cool 30 minutes. Cover tightly with plastic wrap; refrigerate until chilled, at least 4 hours but no longer than 2 days. To serve, uncover cups; gently blot any condensation on custards with paper towel. Sprinkle with additional nutmeg. No nutmeg? Try cinnamon for a slightly different taste.